Klaidi Sahatci is the first Concertmaster of the Tonhalle-Orchestra Zürich and professor at the “Conservatorio della Svizzera Italiana” in Lugano. Born in Albania, he began his musical studies at the age of six. In 1992 he moved to Italy where he was admitted at the "Conservatorio Di Musica G. Verdi” in Milan and studied with Salvatore Accardo at the “Walter Stauffer “Academy in Cremona. Sahatci was the first Concertmaster of the Orchestra of the Teatro alla Scala in Milan and the Zurich Chamber Orchestra. He regularly plays chamber music and as a soloist. 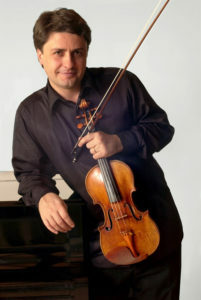 His career as a soloist started in 1994 with the RAI Orchestra.